This spring, outdoor apparel company Patagonia issued a challenge to the nation’s graduate students: they wanted to become carbon-neutral by 2025, and they wanted the best student minds to help them get there. The team from the University of Virginia rose above the rest with a plan that not only outlined a path to carbon neutrality, but also brought the company in line with one of the most ambitious goals of the 2015 Paris Agreement on climate change: limiting global temperature increases to 1.5 degrees Celsius this century. “Becoming carbon-neutral by 2025 is a great goal, but we wanted to go even further in thinking about how that goal fits in with global efforts addressing climate change,” said Stephanie Roe, a UVA environmental sciences Ph.D. student and one of the five team members. With their bold proposal, the UVA team was selected as a top 10 finalist out of 108 teams and ultimately won first place after presenting its ideas at the University of California, Berkeley to a panel of six judges from Patagonia’s executive team. 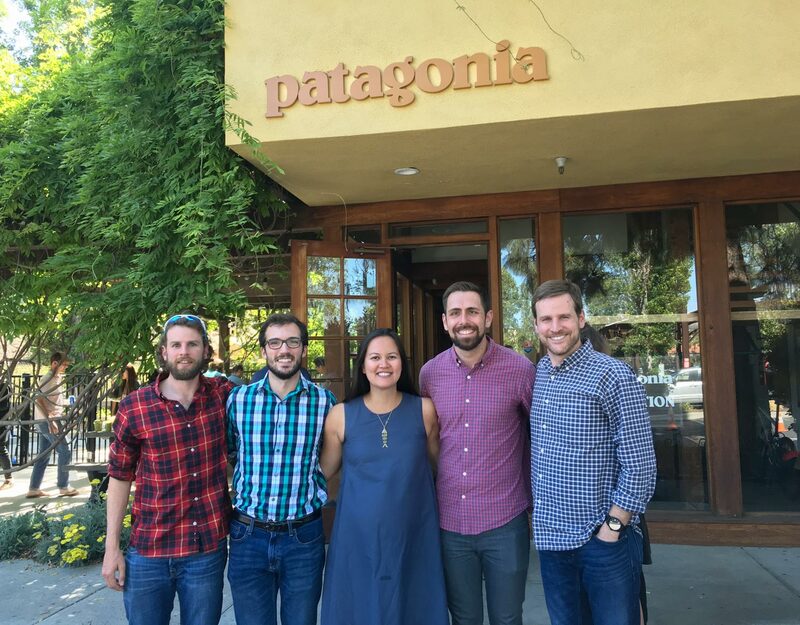 The win earned the team members a cash prize and a trip to Patagonia’s headquarters in Ventura, California, where they spent a day last week meeting with key groups of employees, including Chief Operating Officer Doug Freeman, to discuss how their ideas could be implemented. The interdisciplinary UVA team included Roe, materials science and engineering Ph.D. students Andrew Neils and John Tomko, and 2018 Darden School of Business graduates Bryan Shadron and Ben Strickland. Developing reforestation projects that offset carbon usage. The company was particularly intrigued by the new materials that the UVA team proposed. Currently, raw materials production is responsible for about 80 percent of Patagonia’s total carbon emissions. That can be attributed to both the production of polyester fabrics, which are derived from fossil fuels, and the company’s use of fibers like cotton and wool, which, though they are natural, require significant land and water resources. The UVA team suggested that the company transition to biopolymer textiles, which can be engineered solely from renewable resources. These materials would look and function much like the plastic fibers that make up polyester clothing and other wool alternatives without relying on fossil fuel extraction. Already, Patagonia is investigating products created from spider silk; UVA’s plan highlighted polymers produced by the bacterial fermentation of methane gas and polymers developed from squid ring teeth proteins, found in the suction teeth of a squid’s tentacles. The latter are already being developed in materials labs at UVA’s School of Engineering and Applied Sciences. One of the team members, John Tomko, has spent many hours researching and working with the squid ring teeth proteins at UVA and was able to tell Patagonia employees a lot about how the fibers are developed and how they might function in clothing. “John was really in his element there, showing the work he has already done at UVA,” said Roe, who was also able to directly apply her research on “emissions pathways” – used to project future carbon emissions and map out strategies for achieving the 1.5-degree target in the Paris agreement. “It was really cool to be able to apply our research to something this concrete,” Roe said. “It was important for us to put ourselves in Patagonia’s shoes and think through the business issues they might be dealing with,” he said. Shadron said he particularly enjoyed the interdisciplinary nature of the work, which allowed him to meet graduate students from across the University. “Working on this interdisciplinary team was definitely a big highlight of my graduate experience so far,” he said. All of the team members are hopeful that their ideas will soon make a tangible difference at Patagonia and beyond.